Anaerobic digestion occurs naturally in some soils and in lake and oceanic basin sediments, where it is usually referred to as "anaerobic activity". This is the source of marsh gas methane as discovered by Volta in 1776. With the re-use of waste as a resource and new technological approaches that have lowered capital costs, anaerobic digestion has in recent years received increased attention among governments in a number of countries, among these the United Kingdom (2011), Germany  and Denmark (2011). Anaerobic digestion can be performed as a batch process or a continuous process. In a batch system, biomass is added to the reactor at the start of the process. The reactor is then sealed for the duration of the process. In its simplest form batch processing needs inoculation with already processed material to start the anaerobic digestion. In a typical scenario, biogas production will be formed with a normal distribution pattern over time. Operators can use this fact to determine when they believe the process of digestion of the organic matter has completed. There can be severe odour issues if a batch reactor is opened and emptied before the process is well completed. A more advanced type of batch approach has limited the odour issues by integrating anaerobic digestion with in-vessel composting. In this approach inoculation takes place through the use of recirculated degasified percolate. After anaerobic digestion has completed, the biomass is kept in the reactor which is then used for in-vessel composting before it is opened  As the batch digestion is simple and requires less equipment and lower levels of design work, it is typically a cheaper form of digestion. Using more than one batch reactor at a plant can ensure constant production of biogas. In continuous digestion processes, organic matter is constantly added (continuous complete mixed) or added in stages to the reactor (continuous plug flow; first in – first out). Here, the end products are constantly or periodically removed, resulting in constant production of biogas. A single or multiple digesters in sequence may be used. Examples of this form of anaerobic digestion include continuous stirred-tank reactors, upflow anaerobic sludge blankets, expanded granular sludge beds and internal circulation reactors. Feedstocks can include biodegradable waste materials, such as waste paper, grass clippings, leftover food, sewage, and animal waste. Woody wastes are the exception, because they are largely unaffected by digestion, as most anaerobes are unable to degrade lignin. Xylophalgeous anaerobes (lignin consumers) or using high temperature pretreatment, such as pyrolysis, can be used to break down the lignin. Anaerobic digesters can also be fed with specially grown energy crops, such as silage, for dedicated biogas production. In Germany and continental Europe, these facilities are referred to as "biogas" plants. A codigestion or cofermentation plant is typically an agricultural anaerobic digester that accepts two or more input materials for simultaneous digestion. The length of time required for anaerobic digestion depends on the chemical complexity of the material. Material rich in easily digestible sugars breaks down quickly where as intact lignocellulosic material rich in cellulose and hemicellulose polymers can take much longer to break down. Anaerobic microorganisms are generally unable to break down lignin, the recalcitrant aromatic component of biomass. A second consideration related to the feedstock is moisture content. Dryer, stackable substrates, such as food and yard waste, are suitable for digestion in tunnel-like chambers. Tunnel-style systems typically have near-zero wastewater discharge, as well, so this style of system has advantages where the discharge of digester liquids are a liability. The wetter the material, the more suitable it will be to handling with standard pumps instead of energy-intensive concrete pumps and physical means of movement. Also, the wetter the material, the more volume and area it takes up relative to the levels of gas produced. The moisture content of the target feedstock will also affect what type of system is applied to its treatment. To use a high-solids anaerobic digester for dilute feedstocks, bulking agents, such as compost, should be applied to increase the solids content of the input material. Another key consideration is the carbon:nitrogen ratio of the input material. This ratio is the balance of food a microbe requires to grow; the optimal C:N ratio is 20–30:1. Excess N can lead to ammonia inhibition of digestion. Substrate composition is a major factor in determining the methane yield and methane production rates from the digestion of biomass. Techniques to determine the compositional characteristics of the feedstock are available, while parameters such as solids, elemental, and organic analyses are important for digester design and operation. Biogas from sewage works is sometimes used to run a gas engine to produce electrical power, some or all of which can be used to run the sewage works. Some waste heat from the engine is then used to heat the digester. The waste heat is, in general, enough to heat the digester to the required temperatures. The power potential from sewage works is limited – in the UK, there are about 80 MW total of such generation, with the potential to increase to 150 MW, which is insignificant compared to the average power demand in the UK of about 35,000 MW. 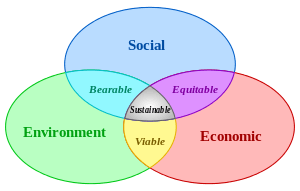 The scope for biogas generation from nonsewage waste biological matter – energy crops, food waste, abattoir waste, etc. - is much higher, estimated to be capable of about 3,000 MW. Farm biogas plants using animal waste and energy crops are expected to contribute to reducing CO2 emissions and strengthen the grid, while providing UK farmers with additional revenues. Biogas grid-injection is the injection of biogas into the natural gas grid. The raw biogas has to be previously upgraded to biomethane. This upgrading implies the removal of contaminants such as hydrogen sulphide or siloxanes, as well as the carbon dioxide. Several technologies are available for this purpose, being the most widely implemented the pressure swing adsorption (PSA), water or amine scrubbing (absorption processes) and, in the last years, membrane separation. As an alternative, the electricity and the heat can be used for on-site generation, resulting in a reduction of losses in the transportation of energy. Typical energy losses in natural gas transmission systems range from 1–2%, whereas the current energy losses on a large electrical system range from 5–8%. Biogas is the ultimate waste product of the bacteria feeding off the input biodegradable feedstock (the methanogenesis stage of anaerobic digestion is performed by archaea (a micro-organism on a distinctly different branch of the phylogenetic tree of life to bacteria), and is mostly methane and carbon dioxide, with a small amount hydrogen and trace hydrogen sulfide. (As-produced, biogas also contains water vapor, with the fractional water vapor volume a function of biogas temperature). Most of the biogas is produced during the middle of the digestion, after the bacterial population has grown, and tapers off as the putrescible material is exhausted. The gas is normally stored on top of the digester in an inflatable gas bubble or extracted and stored next to the facility in a gas holder. Reported scientific interest in the manufacturing of gas produced by the natural decomposition of organic matter dates from the 17th century, when Robert Boyle (1627-1691) and Stephen Hales (1677-1761) noted that disturbing the sediment of streams and lakes released flammable gas. In 1808 Sir Humphry Davy proved the presence of methane in the gases produced by cattle manure. In 1859 a leper colony in Bombay in India built the first anaerobic digester. In 1895, the technology was developed in Exeter, England, where a septic tank was used to generate gas for the sewer gas destructor lamp, a type of gas lighting. 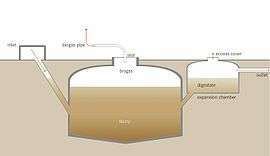 Also in England, in 1904, the first dual-purpose tank for both sedimentation and sludge treatment was installed in Hampton, London. In 1907, in Germany, a patent was issued for the Imhoff tank, an early form of digester. Research on anaerobic digestion began in earnest in the 1930s. ↑ Koyama, Tadashiro (1963). "Gaseous metabolism in lake sediments and paddy soils and the production of atmospheric methane and hydrogen". Journal of Geophysical Research. 68 (13): 3971–3973. doi:10.1029/JZ068i013p03971. ↑ Pamatmat, Mario Macalalag; Bhagwat, Ashok M. (1973). "Anaerobic metabolism in Lake Washington sediments" (PDF). Limnology and Oceanography. pp. 611–627. doi:10.4319/lo.1973.18.4.0611. Archived (PDF) from the original on 16 December 2013. ↑ Zehnder, Alexander J. B. (1978). "Ecology of methane formation". In Mitchell, Ralph. Water pollution microbiology 2. New York: Wiley. pp. 349–376. ISBN 978-0-471-01902-2. ↑ MacGregor, A. N.; Keeney, D. R. (1973). "Methane formation by lake sediments during in vitro incubations". Journal of the American Water Resources Association (JAWRA). 9 (6): 1153–1158. doi:10.1111/j.1752-1688.1973.tb05854.x. 1 2 Anaerobic digestion, waste.nl. Retrieved 19.08.07. ↑ "Anaerobic Digester: How It Works [Process] | GreenTheFuture.com". greenthefuture.com. Retrieved 2016-02-23. ↑ "Landfill Gas & Biogas Analyzers | Nova Gas". Nova Gas. Retrieved 2016-02-23. ↑ A, Igoni Hilkia; Abowei, M. F. N.; Ayotamuno, M. J.; Eze, C. L. (2009-01-16). "Comparative Evaluation of Batch and Continuous Anaerobic Digesters in Biogas Production from Municipal Solid Waste using Mathematical Models". Agricultural Engineering International: CIGR Journal. ISSN 1682-1130. ↑ "COMPARING OF MESOPHILIC AND THERMOPHILIC ANAEROBIC FERMENTED SEWAGE SLUDGE BASED ON CHEMICAL AND BIOCHEMICAL TESTS" (PDF). www.aloki.hu. Retrieved 23 February 2016. 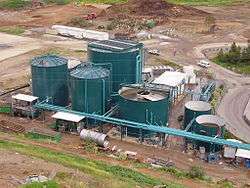 ↑ "Low and High Solid Anaerobic Digestion Technology". www.theecoambassador.com. Retrieved 2016-02-23. ↑ 2008, DEVinitiv GbR,. "Anaerobic Digestion Systems". www.wtert.eu. Retrieved 2016-02-23. ↑ Gupta, Sujata (2010-11-06). "Biogas comes in from the cold". New Scientist. London: Sunita Harrington. p. 14. Retrieved 2011-02-04. 1 2 3 Feasibility study concerning anaerobic digestion in Northern Ireland, eunomia.co.uk , Retrieved 19.08.07. Archived 28 November 2007 at the Wayback Machine. 1 2 Jewell, W.; Cummings, R.; Richards, B. (1993). "Methane fermentation of energy crops: Maximum conversion kinetics and in situ biogas purification". Biomass and Bioenergy. 5 (3–4): 261–278. doi:10.1016/0961-9534(93)90076-G.
1 2 Richards, B.; Cummings, R.; White, T.; Jewell, W. (1991). "Methods for kinetic analysis of methane fermentation in high solids biomass digesters". Biomass and Bioenergy. 1 (2): 65–26. doi:10.1016/0961-9534(91)90028-B. ↑ Animal By-Products Regulations, defra.gov.uk. Retrieved 24.10.07. Archived 16 April 2014 at the Wayback Machine. ↑ Benner, Ronald (1989). "Book Review: Biology of anaerobic microorganisms" (PDF). Limnology and Oceanography. 34 (3): 647. doi:10.4319/lo.1989.34.3.0647. Archived from the original (PDF) on 13 November 2006. ↑ Anaerobic Digestion Initiative Advisory Committee (ADIAC). "Feedstock". Archived from the original on 13 December 2011. 1 2 Richards, B.; Cummings, R. J.; Jewell, W. J. (1991). "High rate low solids methane fermentation of sorghum, corn and cellulose". Biomass and Bioenergy. 1 (5): 249–260. doi:10.1016/0961-9534(91)90036-C.
↑ Richards, B.; Cummings, R. J.; Jewell, W. J.; Herndon, F. G. (1991). "High solids anaerobic methane fermentation of sorghum and cellulose". Biomass and Bioenergy. 1: 47–53. doi:10.1016/0961-9534(91)90051-D.
↑ Benefits of Anaerobic Digestion, afbini.gov.uk. Retrieved 22 February 2010. Archived 9 May 2013 at the Wayback Machine. ↑ Alfagy.com, "Be Green – Make Gas"
↑ "Organics: Anaerobic Digestion". United States Environmental Protection Agency. Retrieved 16 September 2013. ↑ Shah, Dhruti (5 October 2010). "Oxfordshire town sees human waste used to heat homes". BBC NEWS. Archived from the original on 5 October 2010. Retrieved 5 October 2010. ↑ "Satisfaction of reducing your carbon footprint". The Hindu. Retrieved 2012-07-31. ↑ Roubík, Hynek; Mazancová, Jana; Banout, Jan; Verner, Vladimír (2016-01-20). "Addressing problems at small-scale biogas plants: a case study from central Vietnam". Journal of Cleaner Production. 112, Part 4: 2784–2792. doi:10.1016/j.jclepro.2015.09.114. ↑ GE Energy – Jenbacher Gas Engines for Power Generation, power-technology.com. Retrieved 19 August 2007. ↑ work3.pdf UK Biomass Strategy 2007, defra.gov.uk , Retrieved 19.08.07. Archived 16 December 2008 at the Wayback Machine. ↑ Richards, B.; Herndon, F. G.; Jewell, W. J.; Cummings, R. J.; White, T. E. (1994). "In situ methane enrichment in methanogenic energy crop digesters". Biomass and Bioenergy. 6 (4): 275–274. doi:10.1016/0961-9534(94)90067-1. ↑ Biogas as a road transport fuel nfuonline.com. Retrieved 24.10.07. Archived 15 October 2007 at the Wayback Machine. ↑ Haase biogas energy centre haase-energietechnik.de. Retrieved 19.08.07. Archived 17 December 2008 at the Wayback Machine. ↑ Biomass and biogas globalwarming101.com. Retrieved 19.08.07. Archived 21 August 2007 at the Wayback Machine. ↑ Biomass and biogas, globalwarming101.com. Retrieved 24.10.07. Archived 5 June 2007 at the Wayback Machine. ↑ Kompogas Homepage, kompogas.ch. Retrieved 24.10.07. Archived 9 February 2008 at the Wayback Machine. ↑ Dosta, Joan; Galí, Alexandre; Macé, Sandra; Mata‐Álvarez, Joan (February 2007). "Modelling a sequencing batch reactor to treat the supernatant from anaerobic digestion of the organic fraction of municipal solid waste". Journal of Chemical Technology & Biotechnology. 82 (2): 158–64. doi:10.1002/jctb.1645. Retrieved 16 September 2013. ↑ Clarke Energy Reverse Osmosis Unit, clarke-energy.co.uk. Retrieved 24.10.07. Archived 16 December 2007 at the Wayback Machine.